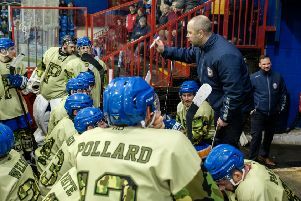 Phantoms coach Slava Koulikov has told his players not to take their foot off the pedal after accomplishing their first mission of the 2015/16 season. The city men sealed their place in the semi-finals of the English Premier League Cup when annihilating Hull Pirates 11-0 last Sunday night. It was a result which also catapulted them into a three-way tie at the top of the league standings along with Milton Keynes and Basingstoke. But Phantoms appear to be in the strongest position of all as they boast one game in hand on the Bison and three on fierce rivals Lightning. Koulikov said: “Clinching a place in the semi-finals of the cup was the first thing on our agenda for this season. “I’m very pleased with the performance we produced against Hull to secure our spot and it also helped to maintain our good league position. “There are three trophies to fight for every season and we have given ourselves a good chance to win the cup which is not something that has happened in previous years. “Just because we have achieved that goal, it doesn’t mean we can relax. “Now we have to focus on picking up results in the league and making sure we meet our targets of finishing as high as we possibly can and qualifying for the play-offs. “It is nice for the fans to see us level with a couple of other teams at the top, but it doesn’t mean anything at this stage. Phantoms are back on home ice this Sunday when they entertain strugglers Sheffield Steeldogs (5.30pm). The two teams have already been involved in one stormy clash this season with Koulikov accusing rival player-coach Greg Wood of failing to control his bench after Phantoms’ 6-4 success in Sheffield a month ago. “I gave my views after the game in Sheffield earlier in the season,” added Koulikov. “I’m not trying to influence what another coach does with his team, but I didn’t like some of the things that happened that night. “I think it is a case of Sheffield trying to change the mentality of their players as they attempt to go in a new direction, but it takes time after playing a certain way for three or four years. It is the first of three successive weekends with only one fixture. Phantoms then face a trip to Manchester on November 22 and a home clash against Bracknell on November 28. A recently postponed away clash at Bracknell could also be re-arranged for a date later this month.